Backup software copies your data to the Cloud. Exellent fully featured backup software that makes it very easy to copy your data to low cost Cloud storage. Only runs on Windows, so Mac and Linux users must fend for themselves. Cloud based storage such as Amazon S3, Amazon Glacier, Google Storage or Microsoft Azure are low cost options that can be used by business and home users alike. Put simply, they provide storage that’s great for backing-up important data. It really doesn’t matter if you are a home user with a collection of letters and photos, or a business with contacts and contracts, Cloud storage makes off-site backup affordable for everyone. But to use this kind of storage, you need software to send your data to the Cloud, and in the event of a problem, to help you get it back again. 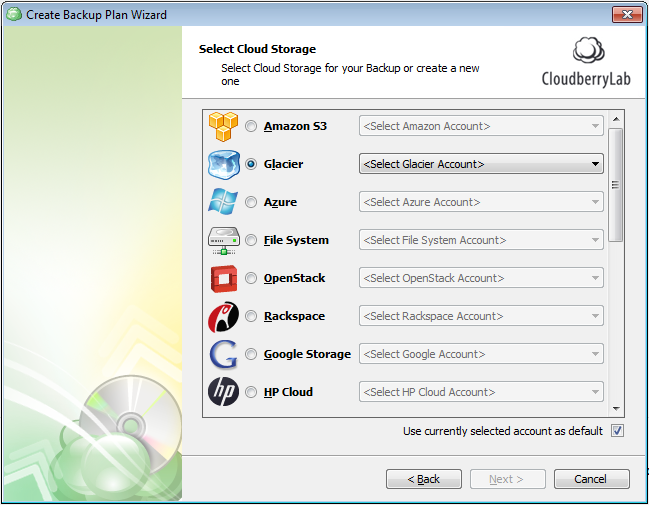 CloudBerry Backup Desktop Edition is software for Windows XP or later that makes it extremely easy to manage Cloud based backups. It’s free for non-profit use, and business users pay $29.99 per installation. A server version runs on Windows 2003 Server and later, and costs $79.99. People with some technical experience will like CloudBerry Backup’s list of features, which includes block-level backups and continuous real time backup. But CloudBerry’s easy to use software means you don’t need to understand this sort of thing to get the best out of it. Installing the software took only a few minutes, and it comes with a free 14 day trial period so you can try before you buy. Within seconds of clicking the button to start our trial period, the main CloudBerry Online Backup Welcome page was open on our screen. This has a clean tabbed user interface, making it easy for non-technical people to use. The welcome page has two buttons in the center – one to “Setup Backup Plan”, the other to “Restore Backup”. 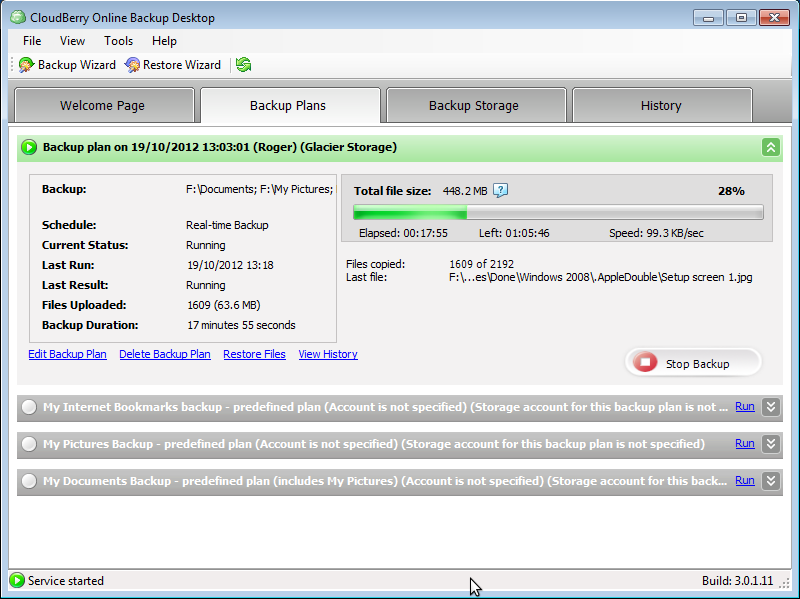 We clicked on the Setup Backup Plan button, which started a wizard that guided through setting up our first backup job. After clicking the Next button the first panel allowed us to enter the details of our Cloud Storage account. We tested CloudBerry using our Amazon Glacier, and once we had provided our Amazon account info the wizard listed our Glacier storage Vaults. Next we were presented with a list of disk drives on our Windows PC that we might want to back-up. The wizard also allowed us to select files using various criteria, such as folders, or with names containing specific characters, or files created after a specific date. We had options to enable data compression for files we were backing up, and encrypting the files so they would be gobbledegook to anyone if they were able to access them in our Cloud storage. Although we think it extremely unlikely anyone would be able to access our cloud storage without our consent, we took the option to encrypt. Other options from the wizard allowed us to manage the number of versions stored in the cloud, and also to delete files from our cloud backups some number of days after they were deleted from our desktop PC. We could schedule our backups to run at specific times, or set them to run continuously, so as soon as a file is changed, the backup copy would be updated. We could also control the maximum amount of Internet bandwidth CloudBerry would use, which means we could leave it running without fear of it swamping our Internet connection. There is also an option to control the times of day that CloudBerry is allowed to operate. Some options are only available if your Cloud storage accounts supports them. For example, we could not select Block Level backup when using Amazon Glacier. Although this is only a brief first look at the CloudBerry Backup software, we were very impressed with how easy it is to setup and use, and the range of features that allow you to tune it to your environment. Because we have published this review, CloudBerry may well let us use the software free for a while. But even if they did not, we’d be happy to buy a copy. This review was published on Friday, October 19th, 2012 at 2:29 pm. You can follow any responses to this review through the RSS 2.0 feed.